1 Begin by preparing the glaze. First, combine the butter, honey, cinnamon, lemon zest, cane vinegar and apple juice in a saucepan. Bring this to a boil over high heat before cooking it to a simmer over low heat, until the sauce is thick. Brush the apples with this mixture and set this aside. Reserve the remaining cinnamon glaze for later use. 2 Now, it’s time to flavour the chicken by rubbing it with the mashed Knorr Chicken Broth Cubes together with the pepper, rosemary, and thyme. 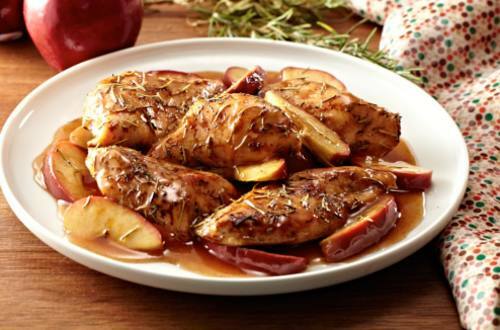 3 In a baking dish, arrange the chicken pieces and glazed apples with a drizzle of oil on top. Bake this in a 375F oven until the chicken is cooked through. Transfer to a serving plate with more cinnamon glaze on top. 4 Your family will surely be delighted and will definitely thank you for it when they see something as fancy as this being prepared for them with love.